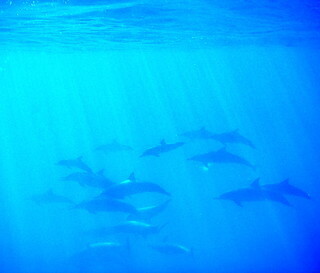 I posted a short video of a pod of wild spinner dolphins chirping and clicking in Lanai'i Hawaii. You can hear the volume directionally as they point at the camera. I took 40 videos and countless photos as I swam with them for about 4 hours on Jan 1 and 3. I will post more as it is fascinating to look at some of their interaction patterns in detail on video. At the time, it was like watching a flurry of bullet-time activity from The Matrix. Strangely, the YouTube transcoding of the baby dolphin video lost all of the high notes, and thus most of the dolphin sounds. And by strange coincidence, as I am going through the video a few nights ago, Photonquantique posted a puzzle of a strange imaging technology, and it turns out to be a CymaScope, designed to visualize the lexicon of dolphin language. “There is strong evidence that dolphins are able to ‘see’ with sound, much like humans use ultrasound to see an unborn child in the mother’s womb. The team has recognized that sound does not travel in waves, as is popularly believed, but in expanding holographic bubbles and beams. I have long held the belief that the dolphin brain, comparable in size with our own, has specialized in processing auditory data in much the same way that the human brain has specialized in processing visual data. Nature tends not to evolve brain mass without a need, so we must ask ourselves what dolphins do with all that brain capacity. The answer appears to lie in the development of brain systems that require huge auditory processing power. There is growing evidence that dolphins can take a sonic 'snap shot' of an object and send it to other dolphins, using sound as the transmission medium. We can therefore hypothesize that the dolphin's primary method of communication is picture based. Speaking of inter-species communication, I have a date with ASIMO tonight. Very exciting. I will not covet its power supply.